Loudon Wainwright III is a widely known and prominent American song writer and folk singer. But what is not so widely known is the fact that he is also an actor having performed in as many as 13 television series and movies. His output in discography is also considerable having produced as many as 25 albums and 40 singles. And in 2009, at age 62 he is still active on the performance circuit in the United States, Canada and Great Britain, traveling widely. Wainwright’s other claim to fame, particularly for this biographical series, is the fact that he is a direct descendant of Petrus Stuyvesant, the more famous and last Director General of New Netherland, a province of the Netherlands, during the 40 year time period in the seventeenth century, when New York was named New Amsterdam. Loudon Wainwright was born in Chapel Hill, North Carolina, on September 5, 1946. 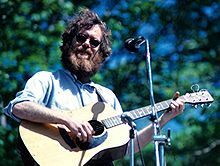 His parents were Loudon Wainwright, Jr., a columnist and editor for LIFE Magazine. Loudon III grew up in Bedford, Westchester County, New York, and went to a private boarding school, St. Andrew’s, in Middletown, Delaware, from where he graduated. Given that his father was an educated person who had graduated from the University of North Carolina in Chapel Hill, one would expect that Loudon also went on to college. He probably did but there is no information on whether he ever graduated. Wainwright’s entertainment career began in the late 1960’s. He had played the guitar during his boarding school years, lived in southern California for a while, but then migrated back to the east coast. While in Rhode Island his grandmother got him a job in a boat yard, and as a side line he began to write songs, including his first song named “Edgar”. During that time period he began to play in clubs focusing on folk songs. He was discovered by Milton Kramer, who became his manager. And his entertainment career took a big jump forward with his first record deal with Atlantic Records which released his first three albums, “Loudon Wainwright III, in 1970, “Album I” in 1970, and “Album II” in 1971. The critics raved about Wainwright’s performance in the albums and compared him with the famous singer, Bob Dylan. Shortly thereafter, in 1972, Wainwright’s career took another big jump with the release of the novelty song “Dead Skunk [in the Middle of the Road]”. Two years later, in the 1974-1975 period, he also appeared on the television screen as “Captain Calvin Spalding”, the “singing surgeon”, on the American television series, M*A*S*H.
As his musical reputation developed, Wainwright began to publish albums in regular frequency. During the 1970’s he published seven albums. He continued his musical output in the 1980’s with the publication of four more albums, including two albums, “I’m Alright”, and “More Love Songs”, both of which were nominated for Grammy awards. He continued his album output in the 1990’s, and in the first decade of the twenty first century, with four albums in each decade. Wainwright has also appeared in a number of films, usually playing small parts, including in “The Aviator”, “Big Fish”, “Elizabethtown”, “The 40-Year Old Virgin”, and in “Knocked Up”. He also has appeared in the television series “Undeclared”. To sum up Wainwright’s entertainment output during his career up to the present, we see 25 albums, 41 singles, and appearances in 13 films or television specials. Wainwright was previously married to Canadian singer and song writer Kate McGarrigle. This marriage produced a son, Rufus Wainwright, and a daughter, Martha Wainwright. Both Rufus and Martha also have became singers and song writers like their parents. Wainwright also has a second daughter, Lucie Wainwright Roche, with singer Suzzy Roche. It appears that Wainwright was not married to Suzzie Roche. Then there is a third daughter, Lexie Kelly, the name of whose mother is not known, but presumably whose family name was Kelly. Wainwright remarried in 2005, again to a woman whose name is not available.